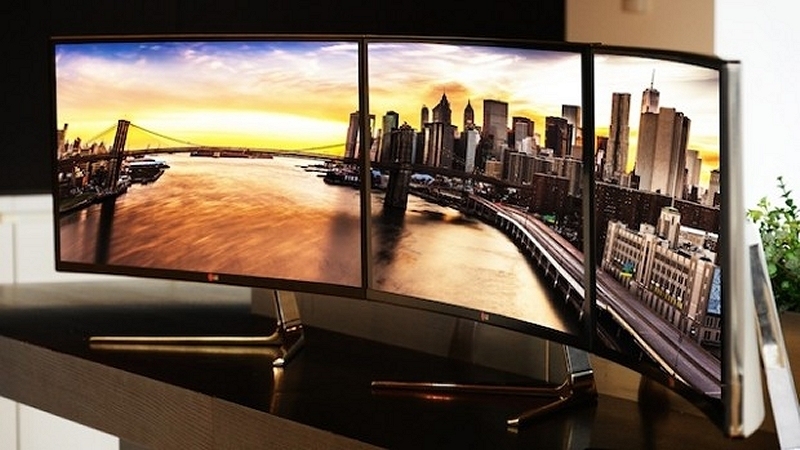 IFA 2014 is fast approaching and in addition to the debut of the Galaxy Note 4, we can now expect to see the world's first 21:9 curved IPS monitor courtesy of LG. The massive 34-inch monitor, model 34UC97, is a widescreen affair designed for both professional users and home entertainment enthusiasts. It features a Quad HD resolution of 3,440 1,440 pixels, supports Thunderbolt 2 connectivity and is compatible with both PCs and Macs. As you may know, Thunderbolt 2 offers data transfer rates of up to 20Gbps in both directions. LG is quick to remind us that it is also four times faster than USB 3.0 and allows multiple devices to be daisy chained together. The monitor also features MAXX AUDIO with a 7w speaker system. It'll likely be no match for a quality set of external speakers or headphones but if you've got nothing else, I suspect it'll do just nicely. Hyoung-sei Park, head of the IT Business Division at LG Electronics' Home Entertainment Company, notes that many people spend more time in front of computer monitors than they do in front of TV sets and yet the industry's biggest monitor manufacturers don't seem to innovate at the same pace as TV manufacturers. The IFA trade show kicks off in Berlin starting on September 5 and runs through the 10th. If you're in the area and want to catch the 34-inch curved display in action, head over to Hall 11.2.